SystemVerilog is a powerful language which can be used to build models of RTL in order to facilitate early testbench testing. The early RTL model uses higher level abstractions like SystemVerilog threads, queues, dynamic arrays and associative arrays. Using high level abstractions allows a functional model to be created with little effort. A simple fabric model is created implementing AXI-like READY/ VALID channels. Building a UVM  testbench is a hard job, made harder when operational RTL is not yet available to test. SystemVerilog  is a powerful modeling language that can be used to build a high level model of hardware before RTL is available. This model is fast to write, and can be as functionally complete as needed. This article will describe the creation and use of a fabric model to build and bring up a testbench. When the RTL is available it can be plugged into the testbench model with little change required. The main contributions of this article are: showing a fully functional model of a medium complexity communication fabric; writing the model using SystemVerilog; and building a reusable testbench that can support block testing as well as support system level tests. The testbench implementation is not discussed in this article. Contact the author for more information. The fabric is a simple two port switch with buffering. Each communication pathway contains 5 channels. Each channel is a Ready/Valid channel with similarities to an AMBA® AXITM  channel. The fabric supports multiple outstanding transactions, pipelining and large burst data transfers. It also supports traffic priority (quality of service). This is the model. It is written using SystemVerilog. Associative arrays are used to manage out-of-order transactions. Queues and dynamic arrays are used for managing lists. Classes are used to hold the transferred information - a class each for RA (Read Address), WA (Write Address), RD (Read Data), WD (Write Data) and B (Write Response), respectively. Packed structs are used for managing the tag bit fields. The testbench is built to test the features supported by the fabric. It is a basic block testbench, testing transfer, buffering limits and other edge conditions in the RTL. This testbench will also be reusable to the system tests. The testbench is a basic UVM testbench with transfer sequences and background traffic sequences available. The actual device under test will be two fabrics connected together, as in Figure 2 on the next page. The RTL implements an AXI-like fabric. It is a simple fabric (simpler than AMBA® AXITM), but has support for quality of service, out-of-order completion, and other high end features. The verification team wishes to get an early start on verification of this fabric. But early, functional RTL is not available. In order for the verification team to get an early start on the verification environment, having an early model of the DUT is desirable. In this article, a theoretical verification team has built a UVM testbench, and needs to make sure that the testbench can check and verify the hardware. The tests are quite simple – generating streams of READs and WRITEs. This theoretical verification team is testing a simple AXI-like fabric (it is not an AXI system). The fabric is a simple two port switch as seen in Figure 1. The system under test connects two of these fabrics. The DUT and fabric models will be used instead of the real RTL and have enough functionality to provide a useful test environment for early testbench bring up. The model is not a completely functioning version of the RTL. Modeling the complete functionality for the RTL would be too large a task for early verification, and offer limited extra verification points. The fabric has two ports on top and two ports on the bottom. The top ports can be routed to either bottom port. The DUT is a combination of two of these fabrics, as in Figure 2. A request is issued at either Master 1 (M1) or Master 2 (M2). It flows out to either Slave 1 (S1) or Slave 2 (S2) depending on many factors including QOS and Address Maps ranges defined. A connection is virtual – the data transfer occurs in hops from master to slave. Additionally, the connections are managed as independent channels. The channels are WRITE ADDRESS (WA), WRITE DATA (WD), WRITE RESPONSE (B), READ ADDRESS (RA) and READ DATA (RD). Each channel operates independently, with a few basic rules. For example, WRITE DATA must start after the corresponding WRITE ADDRESS. READ DATA must start after the corresponding READ ADDRESS. Data transfers from different transactions can be interleaved. A QUALITY OF SERVICE (qos) property exists for each transfer that can be used to prioritize traffic. There are many other features of the fabric, but these basic features are sufficient for the testbench to be built and rudimentary testing to begin. The channel is the most basic bus. It is a collection of signals, organized as the RA, RD, WA, WD and B sub- channels. It is implemented as a SystemVerilog interface. The channel represents the pins of the bus. In addition to the pins, each transfer in the fabric is represented by a simple class, each containing the same transfer information as might appear on the bus. Using these classes to represent the transfers on the fabric makes the fabric quite simple, and powerful (see Appendix XVI for the definition of the types). The testbench is a “regular” UVM testbench, with an environment, test, agent, driver, sequencers, sequences and transactions (sequence items). The basic sequence issues a write of semi-random data to an address, then issues a read of the same address, and compares the data read with the data written. In this way, it is self-checking. Other sequences, corresponding to traffic types (such as video streaming, audio streaming or push notifications) are beyond the scope of this article, but quite easy to create as a collection of memory accesses with the characteristic bandwidth, latency and length. The sequences issue reads and writes. The built-in sequence issues a write then a read from the same address. It then compares the read and written data. Each sequence is assigned a memory range in which it reads and writes. The transaction is either a READ or a WRITE. It has an address and a data payload. Additionally, there is a Quality of Service request field (qos). The tag field is not used by the testbench, but is set by the synthetic fabric we are building. The test is a simple test, but is flexible to provide many parallel threads. It uses two arrays to hold the interesting interfaces – the master (initiators) and the monitor interface. These are set from above using the uvm_config_db mechanism. The test has two associative arrays that hold the agent and sequence handles. The number of these created is controlled by the command line option +threads=N. The number of agents is the number of threads. The number of sequences is four times the number of agents. During the run_phase, the number of transactions that each sequence should create is set from the command line using the +transactions=M option. Each of the created sequences is started, and simulation ends when each sequence has completed. The fabric connects to the pins of the AXI-like interfaces, but instead of pins, the DUT will use SystemVerilog interfaces. Those interfaces were defined above as ‘interface channel’ buses. There are two input channels, i0 and i1, and two output channels, o0 and o1. There are 4 instances to manage the interfaces and queues, two each of slaves and masters (fabric_slave1, fabric_slave2, fabric_master1 and fabric_ master2). The fabric contains queues and arrays to manage the transfers. It also has one big job, deciding which transfer goes out which output port (the big blue oval below). The various algorithms for quality of service and priority are beyond the scope of this article, but would be quite easy to explore using this framework. Figure 9 is a block diagram of the major structures in the fabric. The left-side connections are i0 and i1. The right-side connections are o0 and o1. Inside each fabric, at the inputs and outputs are two slaves and two masters respectively. For example the fabric i0 port is connected outside to a master interface. 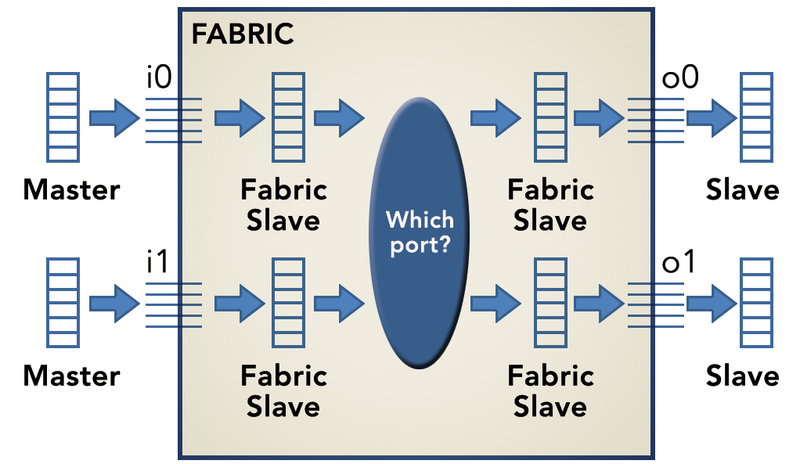 On the inside, fabric i0 port is connected to a fabric slave. Tracing the Read Address (RA) and Read Data (RD) channels can help explain the connectivity (see Figure 1 and Figure 9). The master issues a Read Address (RA). That RA is sent across the i0 channel by wiggling the pins on the i0 channel. 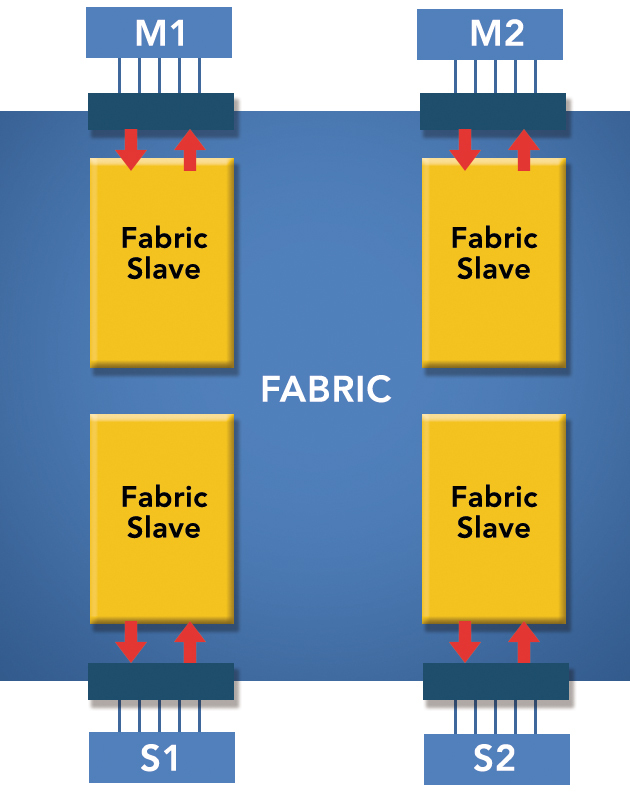 The fabric slave connected to i0 recognizes the RA and creates a read_address_c packet. That read_address_c packet contains all the information from the RA transfer. It is placed into a “work queue” for one of the fabric masters. A thread in the fabric master detects that something has arrived in its work queue, and processes it. The read_address_c packet from the work queue is turned into pin wiggles and sent out the connected interface (either o0 or o1). Outside of the fabric another slave will receive this transfer. In Figure 11, a Read Address (RA) request on the top of the diagram (light blue arrows) traverses across the structures of the fabric, resulting in a Read Address (RA) request executing on the slave memory. The Read Data (RD) response (deep green arrows) traverses the reverse path from the slave memory back to the originating master requester. The fabric slave implementation is quite simple. The slave waits for VALID and READY to both be high on a positive clock edge. When this happens, a transfer occurs. The transfer in this case copies the bus values into a class container that represents the transfer (i.e. read_address_c). The read_address_c packet is pushed into the ra_q that is managed in the slave. Some other thread will decide what to do with the new member of the queue. In the fabric, a thread (the RA_Channel1 thread) is waiting for something in the ra_q from the fabric_slave1. When something arrives, it is removed from the queue and a new tag is created. This new tag is the key to tracing the return values. setup_fabric_tag_R – The new tag. The original transfer contained a ‘tag’ or ‘id’. That tag was created by the master interface, and is a simple counter to be able to match up and organize parallel transfers. Without the tag, the master would not know which outstanding READ address went with which READ data. This function will determine which output slave port the RA request goes to. The tag_matcher_R associative array is used to keep track of in-flight transfers and to do error checking. 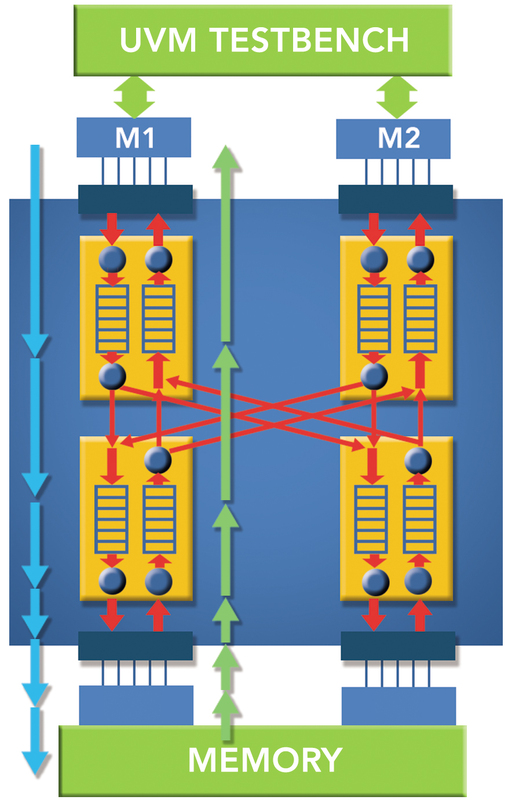 Tags are used within this AXI-like system to connect parallel requests to each other. Tags serve as ids for transactions. As a transaction crosses this fabric, it chooses a path to take. We must ensure that the response ends up back in the right place, so the tag is used to keep track of where the transaction has been, and where it is going. In the fabric, the master could either be 0 or 1, and the slave can be 0 or 1. Two bits each are reserved in the fabric tag. The fabric tag consists of the original tag along with the slave and master information. As the transaction traverses the second fabric (this is a two fabric DUT), the tag is extended again, this time the tag is 16 bits – the previous “extended tag” simply looks like a “regular tag” to the second fabric. In the first level fabric, the slave and master occupy two bits. The tag is 12 bits long, for a total fabric tag length of 16 bits. In the second level fabric, the slave and master occupy two bits, but this time the tag is 16 bits. The tag in the second level fabric is the first level fabric tag (all 16 bits). The fabric master RA_Channel thread wakes up when it finds something in the ra_q queue. That new arrival is popped off the queue, and turned into a pin wiggle. The slave is quite simple, sharing a memory handle with the other slave. 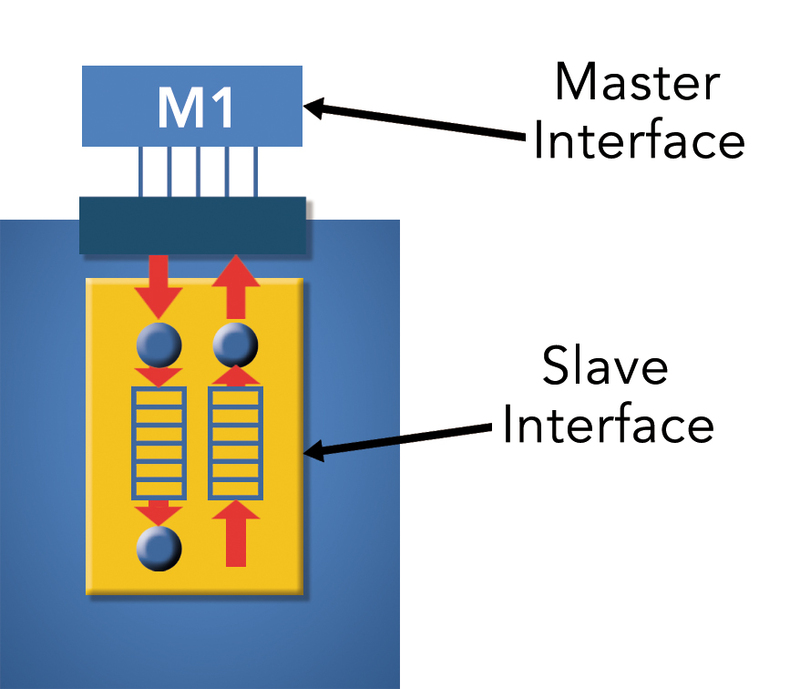 There is one physical memory (mem_interface), but two slave interfaces using it. The RA Channel recognizes a read request and pushes the tag onto the rd_work queue. The rd_work_queue is serviced by the RD_Channel thread. The RD_Channel thread wakes up and performs the requested number of reads, creating a RD response for each one. The test top instantiates 6 channels. Two channels for the input and two channels for the output and two channels for the intermediate connections between the fabrics (see Figure 2). It instantiates two master interfaces, each connected to the input channels. It instantiates the two fabrics, each connected to the proper channels. Finally, it instantiates the two slaves and the two monitors and the actual memory. The simple memory (mem_interface) has two functions: read and write. They provide an easy way to encapsulate the memory access. Each read and write is echoed to standard out, and if a location is read which has never been written, an error is generated and simulation stops immediately. The memory uses an associative array— it is a sparse array implementation. This article has described the implementation of a simple AXI-like skeleton fabric that was used to test the early development of a UVM testbench. It used high level SystemVerilog features such as threads, dynamic arrays, associative arrays, queues and simple classes to manage the complexity of implementing a real fabric. The current system is flexible and could be used as a test vehicle for new quality of service algorithms, or other address map schemes to control transfer flow. The code implementing the fabric is less than 1000 lines of code, and was written during a 5 day period, with another 5 days to debug by one person, as a part-time exercise. The model is easy to read and easy to extend with new functionality or capabilities. It is not a model that is suited for current synthesis tools, but rather is a model used to get complex functionality implemented early in the design phase; enabling early testing and verification. In this example, the DUT modeled was a fabric, but the power of SystemVerilog would allow any model to be written. SystemVerilog is a powerful, general purpose programming language. Miscellaneous types used throughout the testbench and DUT.